The investor had his own vision of the interior arrangement with the living area on the first floor. Additionally, he wanted to place a house in the middle of the plot, far away from the river, where a marina was supposed to be. A new dimension of home Living-Garden Home attempts at redefining the single-family house to integrate architecture with nature. The classic household division into the living area, located in the ground floor and the sleeping area above was transformed into new typology. During the day, we should be able to interact with the environment, with the light (cognitive functions), whereas in the night, we appreciate separation from the environment (safety function). 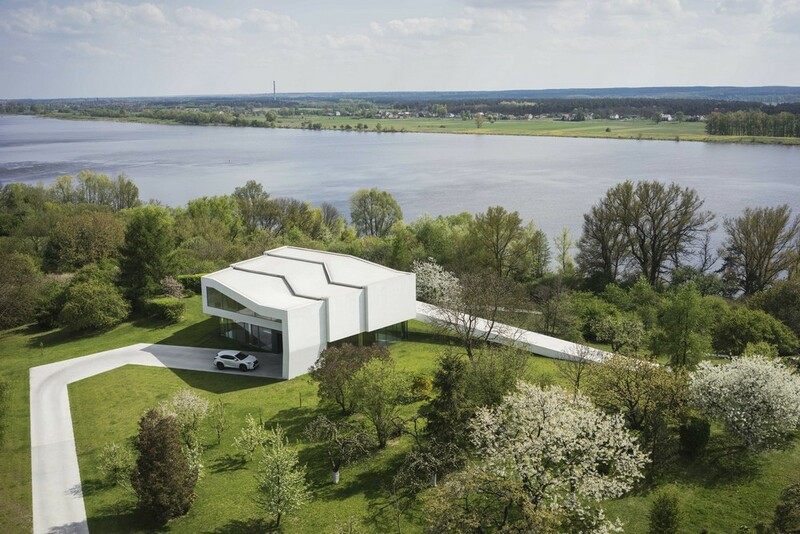 KWK PROMES announce that Auto-Family House has been nominated to the European Union Prize for Contemporary Architecture – Mies van der Rohe Award 2013 – the 6th nomination for their office. The only access to the plot is from the south, effecting in a conflict between the driveway and the garden to be designed. Therefore, the garden and the house is elevated to the level +1 while the entrance stays at the level 0. For the inhabitants comfort the driveway leads them to the garden, creating easy connection between two floors. To preserve the garden intimacy, that could be disturbed with an entrance, the driveway was covered with green roof and walls. As a result the created tunnel rises up into the garden and becomes the house. Construction of the National Museum PRZEŁOMY in Szczecin by KWK Promes (the winner of competition) starts today. Representatives of SKANSKA Leszek Kaszuba and Lech Karwowski, director of the National Museum in Szczecin yesterday signed an agreement to begin construction. In search of the best scenario for this exceptional space, it was not only necessary to consider possibilities of future development, but also to analyse the history of its past conversions. The parcel of present Solidarnosci Square used to be a presentable city quarter of dense development before the damages of the Second World War. As a result of demolition, the previously built-up quarter merged into surrounding openings, creating a large undefined void in the cityscape. Present identity of this memorial square is mostly based on sentimental values, leaving its spatial qualities far behind. These two contrary traditions – a built-up quarter on one side and a plaza on the other – became a starting point of the project, which attempts to blend the advantages of both. It frames the quarter like a building, at the same time keeping values of an open public space. The idea of the National Museum PRZELOMY building arose together with the spatial concept of the entirety. As a natural consequence of the primary assumptions, major part of the volume has been hidden underground. This configuration enabled keeping maximum open space on the ground floor level. Spatial arrangement initiated by the overground building part has been fulfilled with an elevation, which encloses the quarter and creates an amphitheatrical space, well sheltered from the traffic. The project follows functional and spatial conditions of the location – it preserves existing pedestrian routes and provides foreground for surrounding buildings, making this monumental space slightly more intimate at the same time. Its main goal however, is still to complete and integrate the adjacent representative buildings, in order to fully exploit the hidden potential of this part of the city. The planned investment is expected to finished in at least two years. KWK Promes in European Architecture since 1890! We are delighted to announce that our office KWK Promes was appreciated by the internationally well known and acclaimend architectural historian and critic Hans Ibelings in his new book European Architecture since 1890. KWK Promes is the only Polish office, which Ibeling mention in the architecture after 1989 part. As Ibelings says, Robert Konieczny’s office represents a conceptual approach on a concept-follows-program and placed on a par with such eminent offices as Mansilla-Tunón or Lacaton & Vassal. Hans Ibelings is a Dutch art historian and independent architecture critic, exhibition maker and writer of numerous works including: Supermodernism: Architecture in the Age of Globalization, Twentieth Century Architecture in the Netherlands. Ibelings is also the editor of the international architecture magazine A10 New European Architecture (since 2004). European Architecture since 1890 aims to give a more symmetrical picture of European modern architecture, illustrated with over 700 images. The book contains four chronological chapters and four thematic chapters. Central question the author poses is whether there is such a thing as European architecture and – if so – how, where and why does this kind of architecture appear. On 18 Nov (from 5.30 pm) at the BWA Sokół Gallery in Nowy Sacz, is the opening of the exhibition Logic of Space combined with a lecture by Robert Konieczny of KWK promes. A week after there will be a premiere of an installation by KWK promes, which is going to be presented at a collective exhibition in a new exhibition space Kuehlhaus in Berlin. The exhibition ‘Recycling of the Iron Curtain’ is connected with Polish Presidency in the Council of the European Union. The architecture of Robert Konieczny, is created by functional, well thought over, stripped of any unnecessary decorations projects. The simplicity, harmony, clear proportions and clarity of solutions give excellent effects. The architect constantly follows the method of a logical approach to design, subordinating the process of used solutions to the thought. The chosen aesthetics is the resultant of choices that have been made. At the Logic of Space exhibition in BWA Gallery we can see the whole panorama of achievements of Robert Konieczny, i.e. Single family house designs that brought him international recognition and fame, but also newest projects and realizations connected to the public space. The exhibition will let you track the creative process of an architect and familiarize with the works created at his office KWK Promes. The opening of the exhibition is preceded by a lecture of Robert Konieczny. The exhibition takes place at a new art space Kuehlhaus in the cultural center of Berlin- Kreuzberg. The pre-war cooler is going to be heated by the emotions included in the creations of the well known Polish artists. Their exhibition under the flag of the Polish Presidency in the Council of the European Union and the title: Recycling of the Iron Curtain begins at 24 November and lasts until 10 December 2011. The authors invited by the exhibitions curator Piotr Szmitke represent extremely different attitude, even though they are connected by a strong need of marking their independence towards their surroundings, fashion, connections and stipulations of the market. Most of them belong to the turning point generation, which owes the happy final to the transformation of the political system, a generation genetically critical, resistant to the wealth virus, compromise and fiction, ready to face them and to play this dangerous game. The object was to be a gathering place for 8 related families. The key concept was to use a round plan, as a circle had been a symbol of gathering for ages.